Maxine Craft 18th & 19th C.
Payne, Suzanne Rudnick & Payne, Michael, "Images of the American People: Small Portraits from 1820 to 1850", Antiques & Fine Art Magazine, Winter-Spring 2013, 226-233. Page, Melinda, "What to Collect Now: Silhouettes", Country Living Magazine,June 2014, 39-42. Kenney, Al, "Micro-Targeted Marketing, The Art of Marketing", Maine Antique Digest, April 2014, 11-B (pdf attached by permission of Maine Antique Digest). Bennington Museum exhibit "More Like You Than Not", February 2 - May 7, 2013, Artwork from the last 200 years created by artists with disabilities. A great article about the Bennington Museum concurrent exhibits "More Like You Than Not" and "Engaged". Lawrence, Evan, "Accessible expression. Pair of exhibits features artists with disabilities", Hill Country Observer. Viator, Jane, "Picture Perfect", Antiques Roadshow Insider, April 2011 (pdf attached by permission of Antiques Roadshow Insider). Great article about theorem painting. Rutherford, Emma, "Profiles of a New World -- the Portrait Silhouette in North America", America in Britain, Volume XLVIII, 2010 (pdf attached by permission of The American Museum in Bath). Viator, Jane, Shadows From The Past", Antiques Roadshow Insider, November 2010 (pdf attached by permission of Antiques Roadshow Insider). "Through The Looking Glass", Portland Monthly, November 2010. McClard, Peggy, "Antique Tokens of Love & Friendship", http://www.Houston-Antiques.com, September 2009. LeFever, Gregory, "Side by Side, Faces in Black and White", Early American Life Magazine, June 2009. McClard, Peggy, "Antique Silhouettes", Houston-Antiques.com, March 2009. Cloutier, Anne Marie, "Something About Silhouettes", Country Living Magazine, January 2009 (online article at http://www.CountryLiving.com). This article features old and new silhouettes. Please see frame 5 of the online article for part of my collection and inventory. Payne, Suzanne Rudnick and Payne, Michael R., "Six Choices for the Sitter, James H. Gillespie (1793-after 1849)", Antiques & Fine Art, 200 (Summer/Autumn 2008) (online article at AntiquesandFineArt.com). "Let's Go Antiquing - What To Collect Now: Watercolor Folk Portraits", (online article at CountryHome.com; Country Home Magazine online - Home) ,February 2008. Austin, LaGina, "Collecting Make-Dos: The Search for Creatively Repaired Antiques", Dec. 20, 2010. Step Back in Time: Experience a 19th Century Parlor and Hearth, An Interview with Tom Kelleher, Curator at Old Sturbridge Village, Part I, Sept. 11, 2011. This link leads to a website showcasing an exceptional collection of antique sentimental jewelry. Unbelievably wonderful things. Worth a look! The following link is a wonderful demonstration of how to take a profile with a physiognotrace. Mark Osterman is process historian for the George Eastman House he teaches a number of workshops through the museum. This is really a great video demo--check it out! Above is Cindi Rose, on the right, with her daughter, Erica, and Dr. Phil. Cindi is wearing a silhouette pendant that she bought from me....which she wore on the Dr. Phil Show. 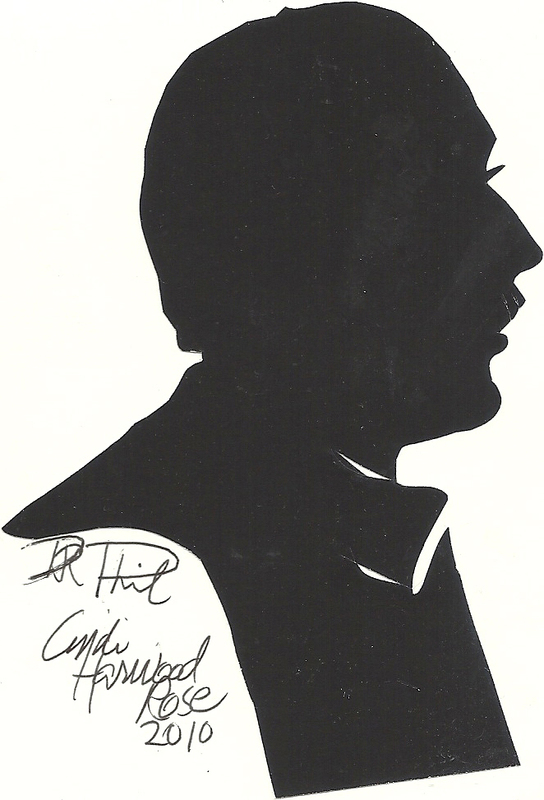 Next is the silhouette that Cindi cut of Dr. Phil. How cool is that? !